Imagine a screw stud on deck of your beautiful boat used to fix a cover being 100% corrosion free and that blends away in the deck color. A final farewell to those annoying eye-catching points that stand out of the smooth design lines, even if they are not corroded. Designers love to have the beautiful lines and shapes of their product not being disrupted by those inevitable points to hold cushions, blinds, carpets or covers down on deck. 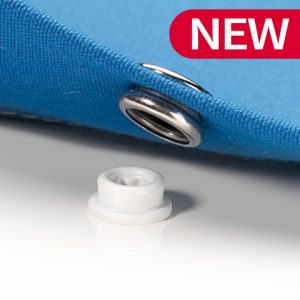 While it entails the exact same and quick installation as a normal screw stud. A unique formula of smart design and high quality materials make it possible to have a composite self-tapping screw stud for use in fiber glass, wood and other composites. CAF-COMPO screw-stud: enabling marine fabricators and boat builders to have their products really stand off from the croud. CAF-compo screw-stud is a composite self-tapping screw stud for use in fiber glass, wood and other composites. The stud is the lower part of a snap or ring-spring press fastener system. The stud will fit any regular ring spring socket, no matter the material nor supplier. It comes in a few white variants to match deck colour of yachts, light grey and black, or any custom colour you like. And finally, no issue with corrosion or wearing out. A version with a metric thread makes it possible to solve the corrosion issue on any aluminum surface, like window-frames. The US Navy showed interest in the features of weight reduction (over 50%) and non-reflective to enable stealth-mode. Until now, it was considered not possible to have a composite screw tap its way into a hard surface like polyester.